Since the closing of the 2008 Olympic Games, the hulking, awe-inspiring Bird’s Nest has become a new landmark for Beijing. This November, the 90,000-seat stadium will be hosting the 2017 world championship of League of Legends, one of the most popular online video games in history, marking the first time for China to host this prestigious e-sports competition. Competitive video gaming, known as e-sports, have been taking off all over the world. Each year tens of thousands of fans fill giant stadiums to cheer on their favorite professional players. A bigger crowd—43 million viewers in the case of League of Legends 2016 Final—watch via live stream at home or internet cafes. In China, where the state media has slammed the world’s top grossing mobile game Honour of Kings for its “poison” effect, it seems absurd that a video game competition would make it into the arena for national pride. The Chinese government’s attitude toward e-sports has long been ambivalent. As early as 2003, China led the world to become one of the first countries to recognize e-sports as an official sports program (in Chinese). Shortly after the encouraging news, however, the main media regulatory body, State Administration of Press, Publication, Radio, Film and Television (SAPPRFT), banned the broadcast of video gaming programs on TV, long popular in neighboring South Korea. E-sports quieted down in China before its growing economic returns became too hard to ignore. A recent report by Penguin Intelligence and China Tech Insights (CTI) shows a surge of 170 million new fans came into China’s e-sports market in just 2016, thanks in part to an increased penetration of smartphones and Tencent’s blockbuster title Honour of Kings. Valued at $3 billion in 2016, the e-sports market in China is expected to hit 220 million audiences at the end of 2017, says the CTI e-sports report. That is, one in every six people in China will have watched e-sports and have a certain level of understanding of the matter. 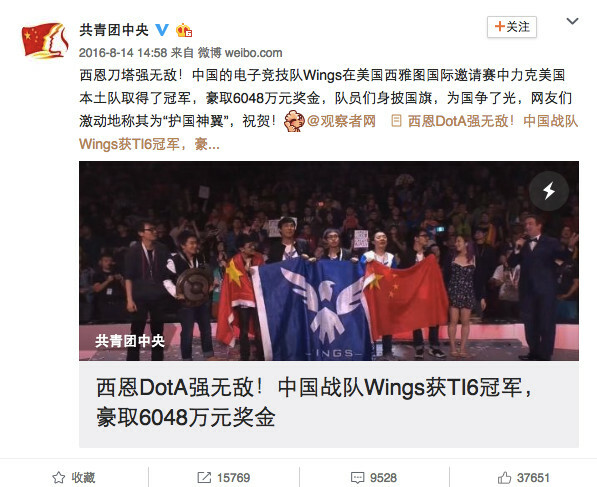 When the Chinese Dota 2 team Wings Gaming won The International 2016 (T16) and took home a record-breaking $9 million prize, e-sports became a point of national pride. State organs, including the Communist Youth League of China, CCTV, and People’s Daily, all congratulated the victory. “E-sports didn’t really take off in China until League of Legends became popular here,” says Shirley Wang, who works for the China e-sports department of Riot Games, the maker behind the popular title. 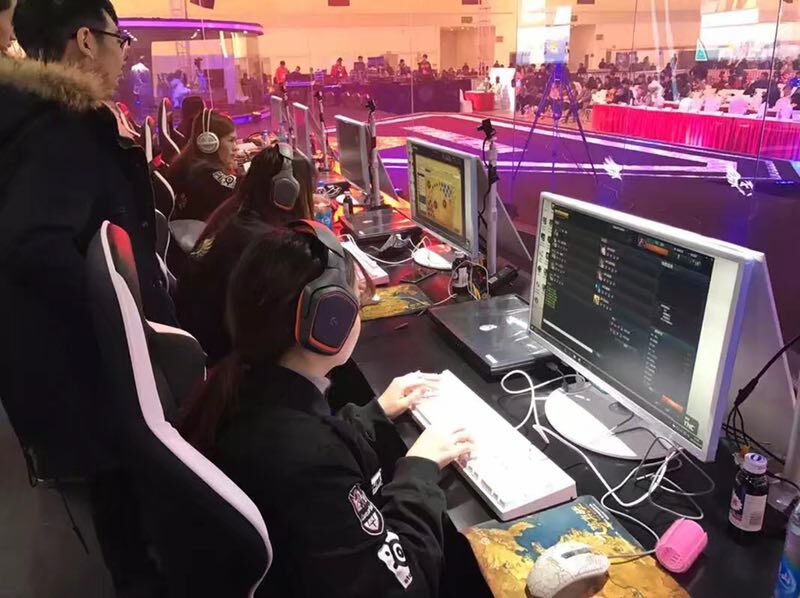 In the past few years, government-funded e-sports towns have mushroomed across the country in lower-tier cities like Chengdu, Xi’an, and Guiyang. Local officials hope that the lucrative new industry would create the same GDP miracle as it did for South Korea following the 1997 Asian financial crisis. 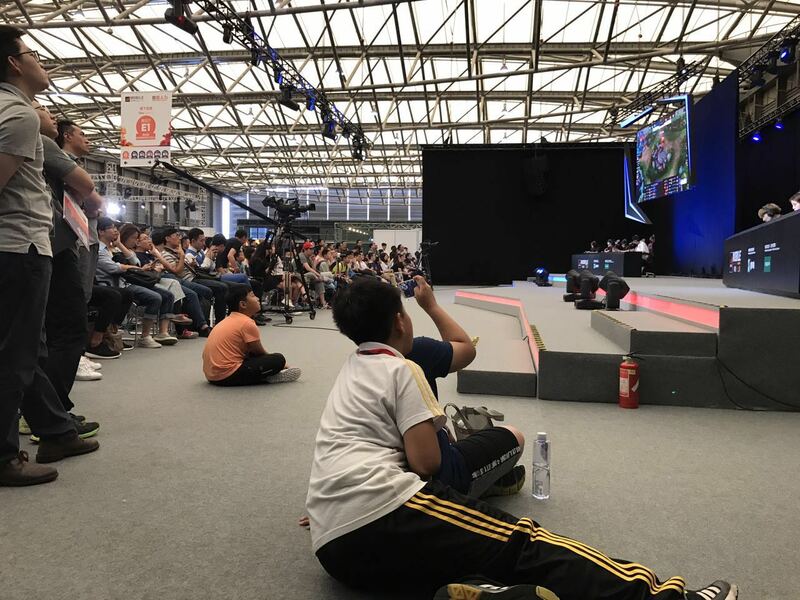 That, in part, may be because people outside of China’s big cities tend to consume more e-sports: 41% of e-sports fans live in 2nd tier cities, followed by 17% in 3rd tier cities, says the CTI e-sports report. Yinchuan, an oasis in the northwestern Chinese hinterland, is one of the cities chasing the e-sports dream. When the Korean-born tournament World Cyber Games (WCG)—widely regarded as the Olympics of video gaming—announced its closure in 2014, the Chinese city of 2 million people said they would carry the torch. The event was renamed to World Cyber Arena (WCA) and officially launched at the solemn Great Hall of the People in Beijing. Businesses have also spotted the promise in sponsoring e-sports, a market with a highly sticky user base ready to pay. More than half of the audience watch more than one hour of e-sports online for each session, and 34.1% of them are willing to pay to watch the competitions on-site, the CTI report shows. Tencent, the Chinese social media and gaming giant who derived 46% of its 2016 revenue from online video gaming, signed an agreement in May with the eastern city of Wuhu to build an e-sports town. Alisports, the sports arm of the e-commerce behemoth Alibaba, announced last March a $5.5 prize pool (in Chinese) to kickstart the World Electronic Sports Games. But very few can climb to the stardom on par with Wings. According to KA’s team captain Nini, the better-paid e-sports gamers make about RMB 15,000 ($2,325) a month, with the lowest being a meager RMB 3,000. “You get aged out quickly too,” says the 28-year-old Shanghainese who was shy to reveal her age: 25 is the watershed year, after which one’s motor skills and reaction time will begin to decline. Nini said she was an oddball, not just in the cutthroat e-sports market but also socially. That craze and professionalism will continue to propel China’s e-sports development forward. “Our hope is that, whenever Chinese people think of e-sports, they will remember how e-sports tournaments have been held at the Bird’s Nest,” Johnson Yeh, who heads e-sports for Riot Games China said in an interview (in Chinese). “And how frenzied the fans are, how superior the production is.” People attending the event will no doubt remember that, but outside the stadium, the triumphant image and lucrative prospectives of e-sports will likely continue to be tempered by the lasting stigma of video gaming.